There won't be any changes to the forward line of Andrew Agozzino, Ben Street and Tomas Vincour. The only difference will be the setting, as they'll trade their Lake Erie Monsters jerseys and the ice of Quicken Loans Arena at the American Hockey League level for Colorado Avalanche sweaters and the ice at Pepsi Center in a National Hockey League game. The trio was called up by the Avs on Friday afternoon and will begin tonight's contest together against the Carolina Hurricanes. Colorado has lost three players to injuries in the past 48 hours as Alex Tanguay (facial fracture) and Dennis Everberg (separated shoulder) left Thursday's contest against Washington and John Mitchell hurt his leg in Friday's practice. With three spots to fill on the roster, it wasn't hard for head coach Patrick Roy to know whom to insert into the lineup. "It made it easy for us after Mitchy got injured in the practice yesterday," Roy said after morning skate. "Let's put these guys together and see how they perform." 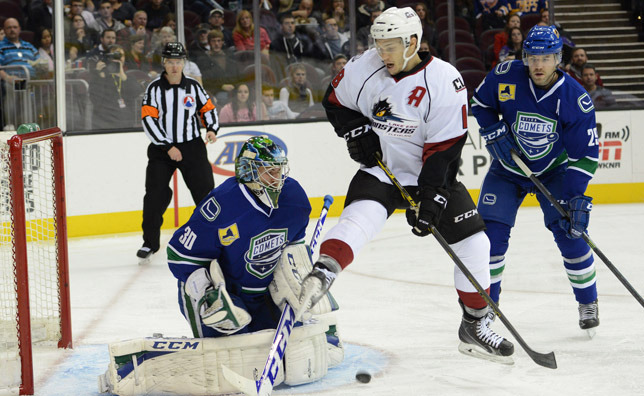 After missing the start of the season with injuries, Street (hand) and Vincour (knee) finally made their season debuts for the Monsters in the last two weeks. Street played his first game Nov. 7 versus Utica, but the line wasn't complete until Nov. 17 when Vincour returned against Grand Rapids. 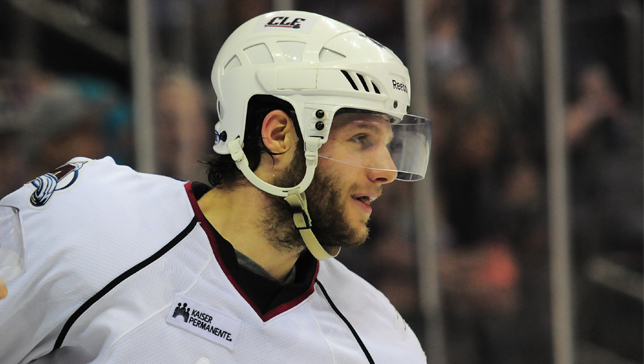 Tomas Vincour with the Lake Erie Monsters during the 2012-13 season. The line has only been together in its entirety for three games, but a solid showing last weekend against Adirondack helped the three forwards get noticed. Each player tallied two points in the two-game series against the AHL Flames, with Street and Vincour both recording a goal and an assist and Agozzino picking up two helpers to go along with his eight points on the year (three goals, five assists). "I'm sure these guys are excited to be here," Roy said. "They played together in Lake Erie and [Monsters coach] Dean [Chynoweth] was very happy with these guys. We'll see how their first few shifts go. If they're performing well, we'll give them as much ice as possible." Vincour said the plan tonight for the line is simple: keep doing what they have been doing and help the team as much as possible when they're on the ice. "We've got to bring the energy," Vincour said. "We've got to stay with the game plan and do our job. We've got to do our best to help the team get two points." Ben Street with the Calgary Flames during a Jan. 30, 2014 game. The NHL is nothing new for Street and Vincour. 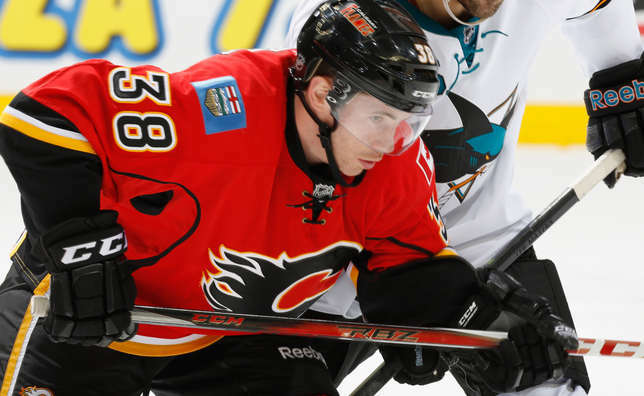 Street was on the Calgary Flames' opening-night roster last season and has appeared in 19 career NHL games, registering two assists. Vincour has played in 88 NHL contests, 86 of them with the Dallas Stars before the Avs acquired him in a trade on April 2, 2013. He appeared in two games with Colorado at the end of that season, registering one assist. He definitely deserves his chance to show what he can do at the highest level. Agozzino led Lake Erie in scoring in each of his two AHL season and had a strong training camp and preseason this year with the Avs, being one of the last players cut. "A lot of emotions. A lot of excitement," said Agozzino, who will have his parents, his brother, a sister and girlfriend in the stands watching tonight. "My phone has been kind of going off the hook the last couple hours since I got called up. I've waited a long time for this. I'm ready for it and can't wait to get going tonight." Andrew Agozzino during a Nov. 7, 2014 game vs. Utica. Street said Agozzino didn't seem too nervous this morning when they were eating breakfast together and that he was more excited than anything. His advice for 'Aggy': "Best way to stay away from the nerves is to prepare the right way, and to prepare like we do for the games down there (in the AHL). It's nice that a full line came down, and we're all playing together. It's pretty rare." Playing with familiar faces will definitely help. "That will be great for us," Agozzino said. "We've played [some games] together now. We've kind of figured out where each other will be on the ice and what spots to be in. It's nice to have a whole line come up, and we'll see how it goes tonight. The Avalanche recently returned from a four-game road trip out East, but it was just part of an early season schedule that has featured nearly every team in the Eastern Conference. Tonight's game against the Hurricanes wraps up a stretch of seven consecutive games versus Eastern Conference teams (Avs are 3-3-0 so far). Colorado has played 12 of its 32 ‘non-conference’ games, which is well over half of the Avalanche’s first 20 games. The only Eastern clubs that Colorado hasn't played after tonight is Buffalo, Columbus, Detroit, Pittsburgh and Tampa Bay. The Avalanche has already played Toronto and the New York Islanders twice. The Avs are 5-5-2 against Eastern clubs this season, which includes a 2-1-1 mark at home. Colorado finished 21-9-2 against Eastern Conference opponents last year, 10-4-2 at home and 11-5-0 on the road. Including this year, the Avalanche is 39-18-5 against the East since the start of the 2011-12 season, 59-28-11 since 2009-10 and 87-48-11 since 2005-06. The Avs have won nine straight home games over the Canes and are 9-0-2 (nine wins, two ties) in their last 11 home matchups versus Carolina. The last time the Hurricanes beat the Avalanche in Denver was Feb. 9, 1996 at McNichols Sports Arena when they were still the Hartford Whalers.